As some have seen the old Rigify, which I’m very fond of, has seen some important updates, lemme pause right there if you haven’t this is the Tutorial for the old rigify, which is still mostly relevant, and so consider this as “part two” or “advanced rigify” so you learn a bit more of the ins an outs of using the newest version shipping worldwide with blender but the general mechanics of setting up a rig is exactly the same. The documentation isn’t complete, but I’d say it’s just enough to understand most of it and so thank you to the MAD Entertainment dudes and the Pitchi Poy guys as well, who worked out these big updates and tried to keep everything documented. Though I’m still missing some features to have a complete professional rig like you’d see at a studio, with things like space switching, or a better facial rig, it’s still my favorite auto-rig in blender, because its super solid and fast to setup and results are pretty good. In fact I recently used it for a couple small tests like this, note that rigging this character took about 20 mins. Also was able to do a small DeadPool animation!. Soooo, lets get to it! As I was mentioning before, I’m missing in this panel a pose space switcher to be able to switch spaces to world, root, or whatever other control control you want with a click, and back… I remember Julien Duroure was creating an add-on called AutoRefSpace for this, but given that this rig aims to bring the important stuff out of the box, that should definitely come with. First: and one of the things I started recently understanding and loving, is that you can make rigify, create bone groups for you, and then define which bones go and colors they get beforehand. Also the “unified select/active colors” is great, now you can really see what’s selected, active and unselected, this bit in blender rigging default setup is very crapy and these guys managed to make it pretty decent and less complicated. In this panel you tell the autorig how to organize, and name your armature visibility layers, tell it if you want to create a “selection set” for that layer (the little circle), and finally tell it int which bone group it will live (color), it looks weird but it’s rather simple. Finally you have your usual Generate rig button, but not without some advanced options, like override a rig that you already had built, or just create a new one. And so the last thing feature I feel I’m missing, is the ability of preset your own setups of meta-rigs with your color, layer setup and every so you can just add it and apply the configuration, or just be able to setup your meta-rig and add it to the add menu, so once you found your ideal setup you can just bring it in each time, but really that’s it. UPDATE (01/06/2018): Oh and as an other thing I would like to see in rigify as an option would be the ability to create double or even triple controllers for at least the root, hands, head, torso, chest, hips. Given that blender doesn’t have animation layers (and it isn’t likely to have them any soon), and the NLA workflow for this is retarded, a good fix that is very common is to have multiple sub controllers, also eases the work to avoid gimbal locks. Next Post The team grows! I have just rigify a couple times, so im no hardly anything about it. Yet i see some weird stuff in that color add panel. First when you need to apply it you dont see the color previews like when you edit the group when rig is build. Another thing is see is that you cant apply a theme but only add a new set. I would like or think it was better if you can apply you theme to an existing one. Just like when want to edit them. Also the unifief option is weird, i would expect when its off it should only apply the color set to the selected one and not the all the groups. Perhaps i can have a look and see what i can do with this. I was checking the bone group color settings and noticed they showed a nice icon showing the colors. After some fiddling i found the code. So now its easier to see what the sets are. PS why dont you add your own set to the Theme settings under Preferences > Theme > Bone Color Sets. If you add your own set to the custom presets, than you can add it each time. Ill try to see if i can add some more, perhaps a menu with custom colors as you wanted. to my concern it should be easier than that, you should only need to pick the color that it is when it is not selected, that’s It, and then the active color and selected color should be unified with the rest of blender. Okay that can be done. But i think they have a reason for the select and active color? Anyways, you can easily make a custom bone color set. PS in the sets, number 16 / 20 are the custom ones. The others ones can also be set. Hey i hacked something together now. Its not as working as i want at the moment but it does store all bone groups, with there colors and you can make sets if you want. wow dude, youre a master!! Okay after reading the article again, you would like to be able to save everything into a single preset…. oeffff thats a bit more hustling actually. Everything is divided over multiple panels. Would be nice. I looked into the sapling tree addon. But this saves all settings in a bit different way. Not sure im capable of doing such a thing. Okay, its not that hard actually. I simply need to collect all inputs. Its only the bone color groups which is still wicked to solve. I can collect all settings, but you need to add the correct amount of groups prior for using the preset. Than i think it will work as you wish. Do you have perhasp a simple model/armature i can test? The most simple thing you can actually do is make template. SImply set the rig up how you want and save that. Than when you need it simply append it. Perhaps i can add something so we can save different models as custom presets in the addon folder. I got the other part almost completely working. I had not thought of the bone rigs setups yet. I think the only way is doing template files. Whaaa i feel like an idiot! 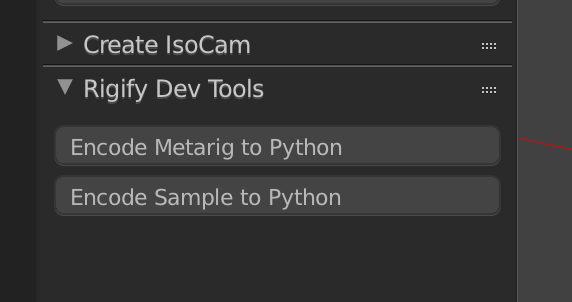 I finally made some hack possible where you could save a blend file with the metarig and also add a menu to append this rig back into blender. I went on searching for creating metarigs….. tada… now comes the idiote part! It seems this function you need is already build in. When you create a metarig and your done. Go into edit mode. There will be a Rigify Dev Tool panel and when you hit that encode button it creates a py file in the text tool panel. When you save this file to the metarigs folder your done. Now you can add your rig right from the start and need to hustle with my dirty workaround. That’s fantastic!!! 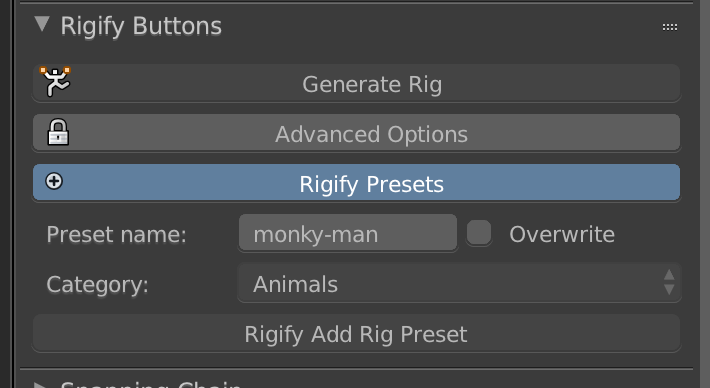 !, now we just need to be able to create our own rig types, so we can create a better facial rig and have it as a part of rigify! niiice, i had seen those panels before but never new what they where for!, sweet! Let me know if you would like that other option as well. Not sure its still useful after i found those 2 buttons which actually does save a preset. Wonder why its sort of hidden. They could easily make this work much better by showing these buttons on object mode as well. Than let the operator go into edit mode and than even save the file to the proper preset folder. thank you for taking all the time to research! Okay i think this is it. Im not sure about the button location. Perhaps i should go into advanced settings. But i think this preset also need to be visible when your in edit mode. I do need to add perhaps on more option, that is to add folders as well. Now it only adds them to folders chosen from the dropdown. Okay i got it working properly now. I just hope this works on windows, because i used forward slashes. Im not sure if python on windows uses the same. Otherwise i need to make an exception for that. Here’s a quick preview, you can add preset by adding a name. I also added option to overwrite existing ones and it does check if the same name has been given. For now you need to use only lowercase and cant use weird other characters. I need to add that part i think. 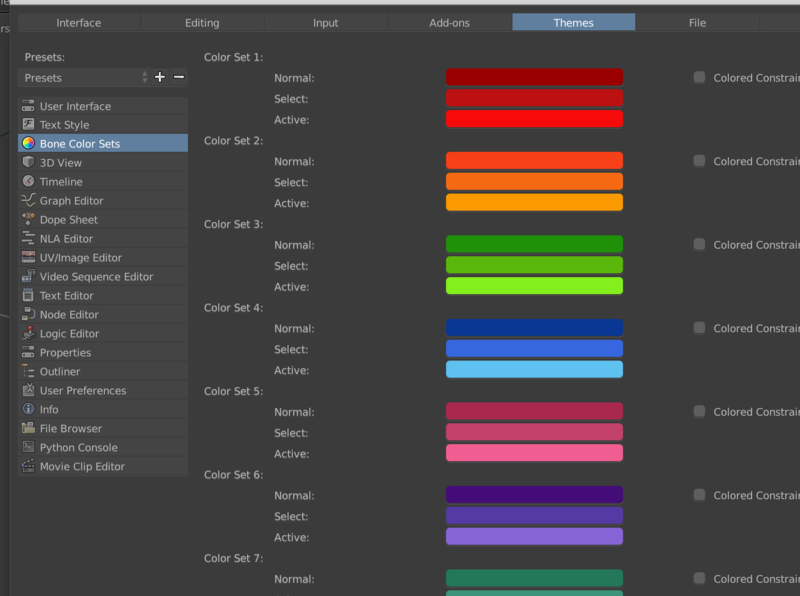 You can also add new preset folders if you like. No, i haven’t really had any time, I have 10 posts pending to finish, a lot of work a trip to chile, moving countries for new work, and all. so havent really had any time what so ever!, sorry mate. whatever help you need on that lemme know! Ahh okay moving back thus, thats always tons of work. Especially emigrating and such. I was just curious if this is what you need. I have not received any feedback yet, not from BlenderArtist as well. did you try creating your own rig types? >> not metarigs but parts. It doesnt seem to work with Windows. I can install it but the button doesnt show up. I get the usual ‘upgrate to 2.8x required’ but i dont think thats the problem. well all of what i wrote about it was in 2.79 time, so maybe in 2.8 its not really completely working yet. How is the correct workflow for adding extra bones for a hair rig? 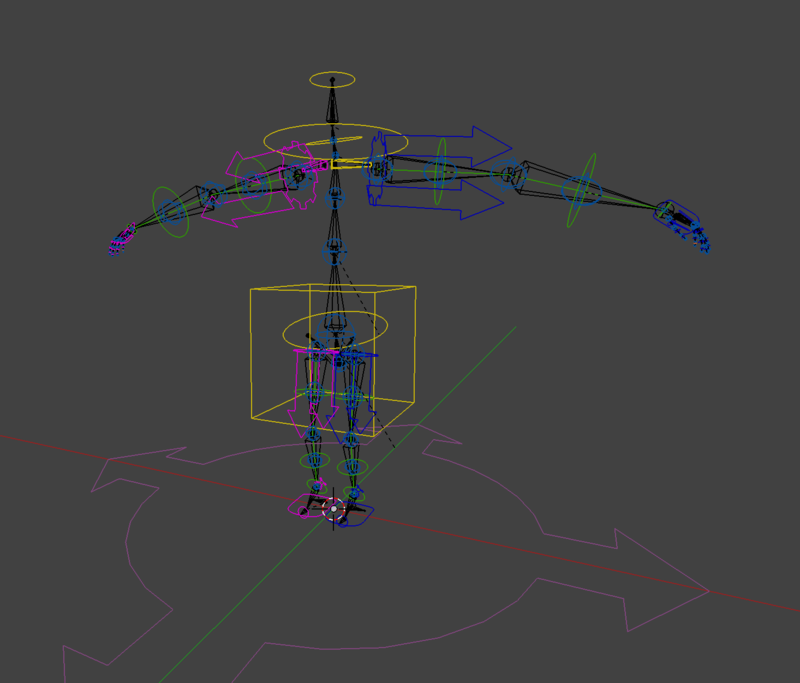 I’d like to create a very detailed (lots of hair strands) rig system, but I’d like to add it to the riggify metarig, so it will get generated in one single armature. Problem is that the extra hair bones get sent to another hidden layer, and when I parent that to the mesh, the extra vertex groups (weights) don’t get added to the list of vertex groups from riggify. How do I correctly add more than 24 new bones for hair rig into riggify and generate weights (vertx groups listing?) Thanks. Hi. Why Pablo? haha. Not my name. It´s Pierre. 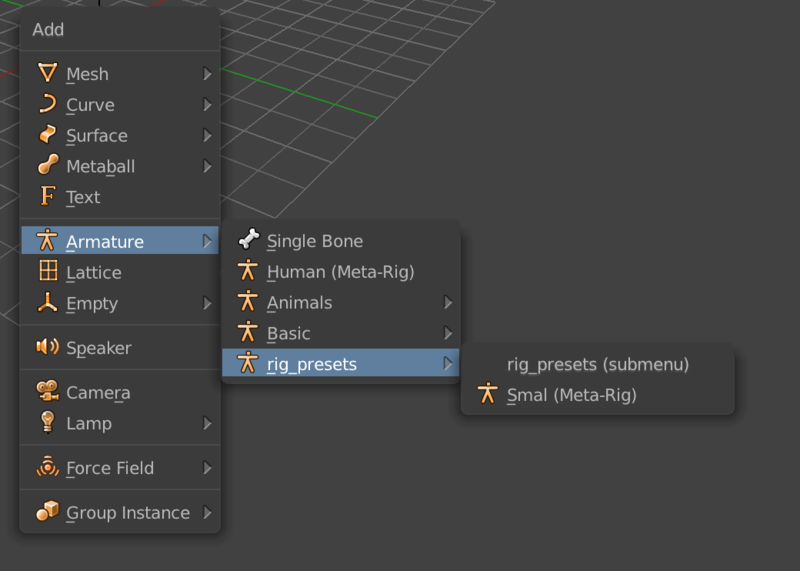 All right, so I create the bone, attach it to the metarig (or duplicate it from any other close bone in the metarig), switch to POSE mode and go to the bone property type Bone, and select what kind of chain it will be from the presets. Yeah, it´s basically hair, so I hope basic.copy_chain will do. When I generate the rig all of those chains get sent to a far hidden layer. Why don´t they appear on layer 1? Also, they don´t have controls and come locked in quaternion mode. ah haha in my head you where pablo schillier but you’re right ! sorry my bad!